The 12th International Antalya Sand Sculptures Festival has opened its doors to visitors in Antalya with the main theme "The Legends." Nearly 200 sand sculptures describing various times and places, which were made by 20 sculptors from different countries using more than 10,000 tons of sand, are being displayed at the festival space located at Lara Birlik Public Beach. Besides structures such as the Chichen Itza of Mexico, the Eiffel Tower of Paris, the Colosseum of Rome, there are mythological and legendary sculptures such as dinosaurs, dragons and the Norse mythological figure Thor. Legends made of sand provide great views at night thanks to a special lighting system at the festival place. Director of the festival Cem Karaca told an Anadolu Agency (AA) reporter that they chose the theme of this year's festival as "The Legends." 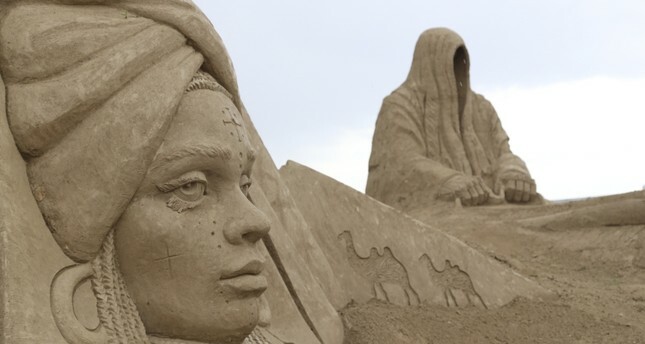 "We presented 200 sculptures that 20 sand sculptors made with 10,000 tons of sand. Thanks to the lighting the atmosphere becomes fabulous after 8 p.m. Our visitors have the opportunity to see the most striking examples of the world's legends here," said Karaca. Stating that the exhibition can be visited between 9:00 a.m. to 11:00 p.m., Karaca emphasized that they provided children between 4 and 13 years old with the opportunity of making sand sculptures using kinetic sand as a different activity from previous years. "At the Magic Sand Castle we give our child visitors the opportunity of making their first sand sculpture using kinetic sand and then we give them a certificate at the end of the activity," said Karaca, adding that the event would be open for 12 months.